buzz forums • View topic - Matilde tracker, as vsti, theoretically possible? Matilde tracker, as vsti, theoretically possible? Post subject: Matilde tracker, as vsti, theoretically possible? Wondering if it is theoretically possible to make a vsti version of Matilde tracker? It's source* is known anyway. It could work as follows. Drag and drop samples onto it, they are auto-sorted alphabetically, you can reorder them, if you want. So each sample content and its number is available to the plugin. This plugin could be even interfaceless, so any other editor could use it by sending some signals to this plugin, not sure how this could be done, OSC maybe? - First half of this plugin would be interfaceless, drag and drop your samples into it, in the background all matilde effects are supported. Now we need its second half, getting its input lines or commands or signals. - Second half could be any editor, having the typical tracker interface, like protracker, sending its line data, after each line, meaning in real-time, as osc events, to this plugin. What do you think of the general concept or idea? Just to know it this would be theoretically possible? This could have many advantages. The first half and second half, both, could be independently developed and improved, plus of course bringing the tracker fun, using samples with protracker commands, directly into the heart of any DAW, like Reaper. Reaper has for example hackey trackey, hackey patterns, hackey machines already, as lua plugins. However this is just for midi editing. All the protracker sample effects are not available there. Another variant of such a lua plugin could just send the osc events, if there would be a first half vsti matilde tracker plugin, as described above. Thanks for reading. Post subject: Re: Matilde tracker, as vsti, theoretically possible? Yes, but this is too far away from buzz workflow. hackey trackey lua plugin for Reaper is actually perfect, only there is no Matilde tracker like sampler which could be triggered with it. For me a fusion of Matilde and Fuzzpilz Inp would be great. A granular mutitrack sample player with access to the wavetable. Aah, a multiout would we nice, too. 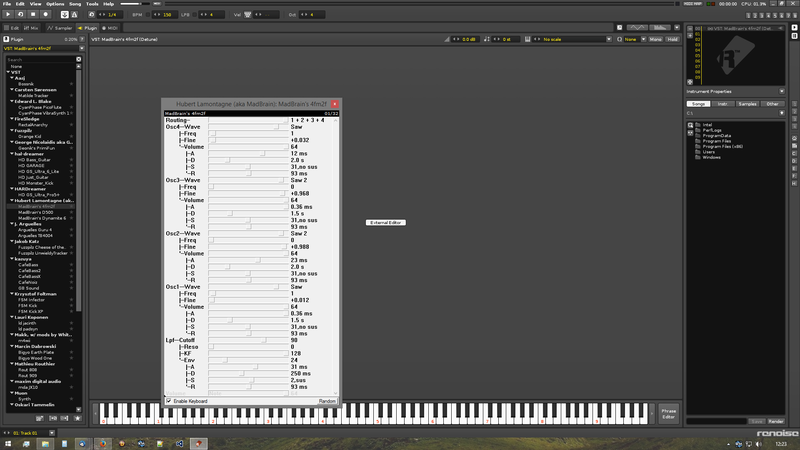 I coded a buzz shell vst for private use, works also fine with matilde and unwieldy. I could ask Oskari about this to release it officially(however I doubt Oskari would allow this one). No problem, thanks for answering, it looks great, at least we know now, it is theoretically and practically possible. Maybe someone can recreate it in future. 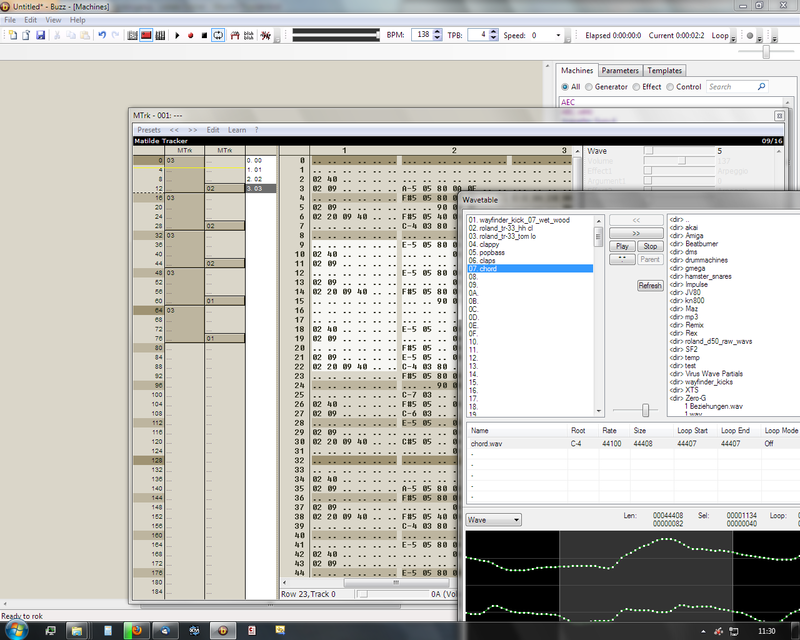 I like in this buzz.png how you can see all in one view, sequencer, pattern editor, and some parameters on the right. Is this a special view in latest buzz or can we have this also in buze 0.5.9 or buze 0.8.9? From what I understood from those pictures you created a wrapper for buzz generators for vsti. But did you create a special version for Matilde so you get the wavetables, or did your software do this automatically, somehow? I am guessing, you programmed a special new variant of Matilde tracker? - the samples you can load into shortcircuit 1.1.2, Reasamplomatic5000 or sitala*. At least something, to play with in hackey trackey.